Manganese, having six stable oxidation states (0, II, III, IV, VI and VIII), three oxidation states with significant multiplet splitting (II, III, IV), one oxidation state with less defined splitting or broadening (VI), and overlapping binding energy ranges for these multiplet splitting structures, presents a serious challenge for both qualitative and quantitative analysis. Nesbitt and Banerjee use curve fitting of Mn 2p3/2 spectra to interpret MnO2 precipitation and reactions on birnessite (MnO1.7(OH)0.25 or MnO1.95) mineral surfaces[2,3,4]. These papers provide excellent detail of FWHM values, multiplet splitting separations and peak weightings for easy reproduction of their curve fitting procedure. Binding energies are quoted uncorrected for charging and the measured adventitious C 1s charge reference of 284.24 eV can only be found in one paper. Fitting parameters are based on standard spectra of MnO, natural manganite (MnOOH) and synthetic birnessite films (MnO2) recorded on a Surface Science Laboratories SSX-100 X-ray photoelectron spectrometer equipped with a monochromatic Al Kα X-ray source. These fittings, with binding energies now corrected to adventitious C 1s at 284.8 eV (original data were shown uncorrected), are presented in Table 1. Also presented are peak parameters for a sputtered cleaned metal surface taken using the same instrument and analysis conditions. Table 1. Mn 2p3/2 spectral fitting parameters compiled from references [1, 2, 3 and 4]: binding energy (eV), percentage of total area, FWHM value (eV) for each pass energy, and spectral component separation (eV). Metal peak parameters were from spectra taken using the same Surface Science Laboratories SSX-100 X-ray photoelectron spectrometer and conditions as the above references. Fitting parameters for recent spectra  of the metal, and powder standards MnO, Mn2O3, MnO2, K2MnO4 and KMnO4, are presented in Table 2 with spectra for these standards given in Figures 1 and 2. 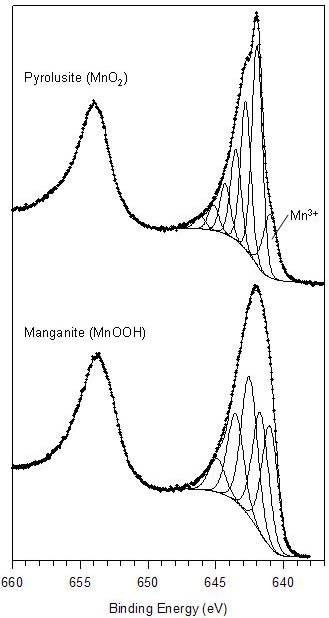 Spectra and fittings from in-vacuum fractured minerals specimens of manganite (MnOOH) and pyrolusite (MnO2) are also presented (Figure 3 and Table 2). These fittings are based on the parameters presented in Table 1 and modified as needed. Table 2. Mn 2p3/2 spectral fitting parameters: binding energy (eV), percentage of total area, FWHM value (eV) for each pass energy, and spectral component separation (eV) . Figure 1. Mn 2p spectra for (bottom) Mn metal, (middle) MnO, (top) Mn2O3 . Figure 2. Mn 2p spectra for (bottom) MnO2, (middle) K2MnO4, and (top) KMnO4 . Figure 3. 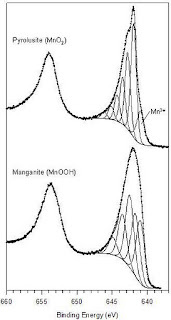 Mn 2p spectra for (bottom) manganite (MnOOH) and (top) pyrolusite (MnO2) . H.W. Nesbitt, D. Banerjee, Am. Mineral. 83 (1998) 305. D. Banerjee, H.W. Nesbitt, Geochim. Cosmochim. Acta 63 (1999) 3025. D. Banerjee, H.W. Nesbitt, Geochim. Cosmochim. Acta 63 (1999) 1671. D. Banerjee, H.W. Nesbitt, Geochim. Cosmochim. Acta 65 (2001) 1703. As recent article from Eugene Ilton uses a similar approach to that above. Ilton uses high quality 2p, 3p and 3s peak-shapes from a variety of species (ranciete (Mn(IV)), manganite (Mn(III)) and MnO (Mn(II))) to investigate unknown samples. A test of the use of the Mn 3s splitting values as a means to determine oxidation state shows it to be not of great value (i.e. doubt is cast on its usefulness). E.S. Ilton, J.E. Post, P.J. Heaney, F.T. Ling, Appl. Surf. Sci. 366 (2016) 475.